The best way to overcome the fears of life, is to face them head on! The biggest fears in life are often the challenges that it throws at us. Fear of failure, rejection, loss and most often the fear of the unknown. If we run away from our fear, It would keep following us. Until we decide to face it head on! Inspired from the photograph series of Pol Ubeda Hervas titled ‘I’m not there’, we created an interactive installation titled ‘Face your fear’. The main component of the installation is a pair of shoes which gets a shadow of an imaginary person wearing them when anyone approaches the space. This unknown entity represents your fear and is defined by you. If you come closer to it, it shrinks while going away from it makes it bigger. If you try to run away from it, the shoes and the shadow would turn accordingly and follow you along. Forcing you to face the fear by looking right into its eye. The setup is in the dark and the shadow is white symbolizing that fear is unreal and can be conquered upon. The installation was made with the use of a Kinect, Arduino, Winch Servo and Processing. 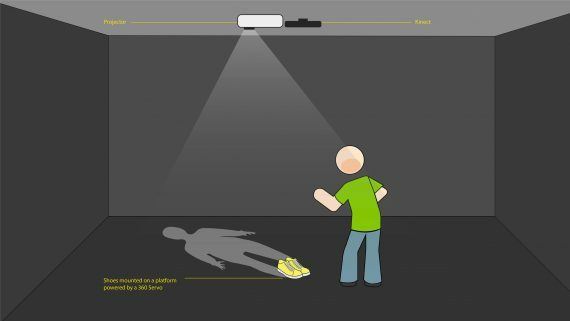 The projector along with the Kinect was mounted on top of the ceiling to detect the position of the user and map an image of a shadow on to the ground. A 360 degree servo was connected with an Arduino to rotate the shoes according to the position of the person. The project was divided into three smaller stages. The first stage was to calculate the angle of a variable moving element (mouseX, mouseY) with respect to a static point and sending it over serial to move the 360 degree winch servo motor. The second was to orchestrate a shadow image according to the variable element. And the third using the Kinect to detect the movement of the person on stage. Once these three parts were ready, it was then combined in one single code to execute. Getting the image projected on the floor and mounting the Kinect was one of our biggest challenges. There were three codes involved in the project. The Arduino code was for rotating the 360 degree winch servo to point the shoes towards the user. The Processing code picked up the location of the person with the help of a Kinect and sent it over serial to the Arduino. The web simulation was done through converting the code into p5.js code.